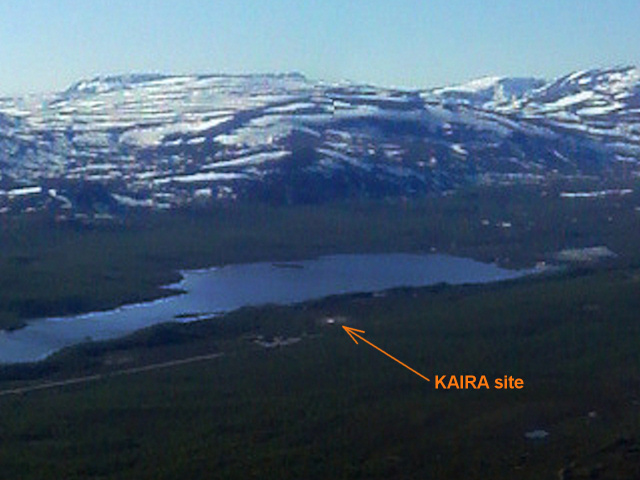 If you stand at the summit of Saana, the second highest point on the mountain obscures the view of the KAIRA site. 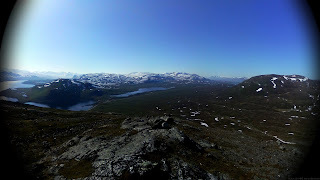 However, if you go to there, or any of the next few ridges down on the northwest slope, there is a clear view of the road from Finland to Norway, Siilasjärvi (another lake) and KAIRA. 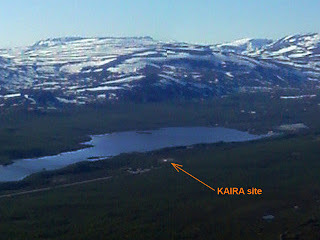 It's actually difficult to make out the site in the wide-angle photograph, so here's a zoomed-in view to point it out. The cleared, flattened area just manages to stand out from the surrounding landscape. However, the stacks of timber HBA frames are very distinct. As you can see, the site is actually closer to Siilasjärvi (although there is no town or village there, which is why it is named as it is). In fact, this image shows a piece of all three countries (Sweden, Finland and Norway). It is a very inspiring view. Now that is what I call a great view. I would love to take shot from that high up myself. In fact, that's one of the reasons I went out and bought my gopro camera in the first place.